So what in the world is “Squelch” and how does understanding it make my wireless system more reliable (and better sounding? It’s set and optimized at the factory, right? Well, yes, but it is likely set for a single channel system operating with its factory whip antennas. But as your system becomes more complex with multiple channels of wireless and IEMs, remote antennas, and antenna distribution (especially multiple distros) the factory setting may be less than optimum. To refresh your memory, the squelch systems in wireless microphone receivers operate in a similar fashion to a noise gate in an audio system. Its primary job is to mute or "squelch" the audio output from your receiver if the receiver loses signal from your mic transmitter. If it wasn’t there you would likely hear a blast of noise and hiss when the transmitter gets shut off or moves out of range. For some additional background be sure to check out our previous blog post on the subject. Adjusting the squelch is relatively straightforward. You simply set your mic up (powered on) at the furthest distance (or worst case) you ever expect to use it and adjust the squelch at the receiver until it just gates off your mic. Then move it back up just a little for an extra margin of safety. In this manner, the squelch is adjusting the maximum range of your wireless microphone transmitter and receiver. Remember that having a system that has more range than you need is a problem waiting to happen. Most wireless these days is rated for 300’ but if you only need coverage for 100’ then when your transmitter is turned off your receiver is searching even further into the ether and it will invariably find some junk out there that will become audible noise if the squelch system doesn’t mute it. Technically a receiver is actually looking for thousands of miles for signal so it has no difficulties finding some OTA TV station 100 miles away. Re-checking and adjusting the squelch is also a good idea when adding more channels of wireless to your system or when using remote antennas and distros. 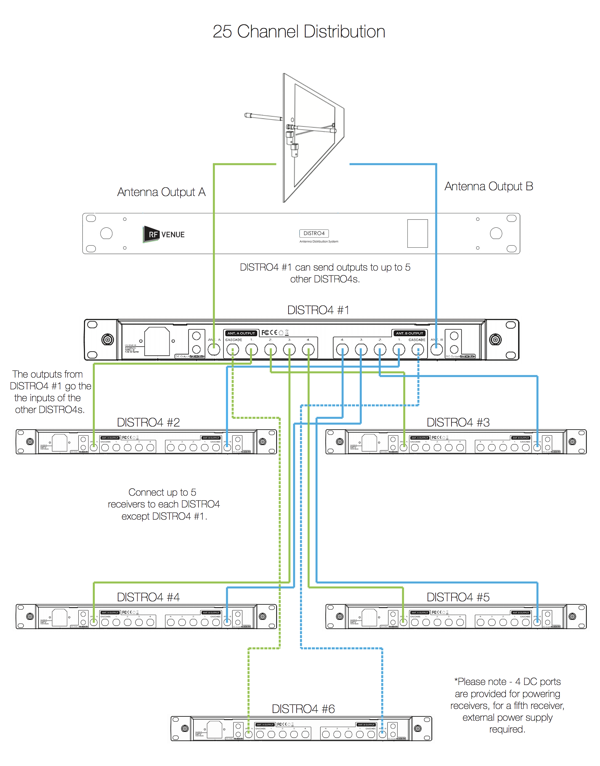 When adding remote antennas and antenna distribution it is common to see additional gain and noise in the system. This is especially troublesome when cascading a number of distros together. Each antenna distro likely has a few dB of gain at each cascade output, and when they are daisy-chained together there may be as much as 10 dB of noise added in the last unit of the chain. If you plan to use more than 2 distro units a better way to combine them is to use the top system as a "master" and then feed the additional distro units from the master unit instead of from the cascade ports. That way you don’t lose an additional generation as you go down the chain. See diagram below, or click here for a PDF copy. So if you did end up with 10dB of gain it stands to reason that your factory squelch setting is off by a factor of 10, hence the occasional noise blasts. As always, everything depends on your exact circumstances and location. In these days of shrinking bandwidth and additional rogue RF interference every improvement you can get for free is certainly a good thing. In closing let me add, most digital systems don’t have or need squelch controls as digital radios construct the audio from a code of 1s and 0s. 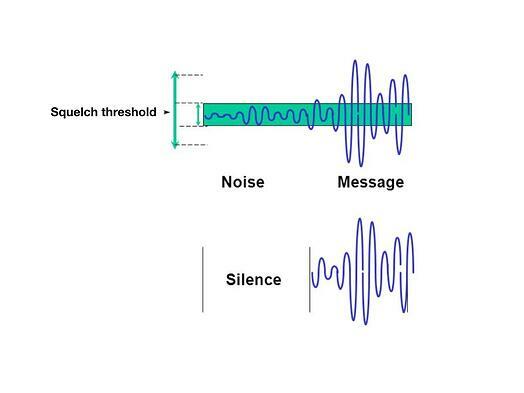 If the code is not understood by the receiver then no audio is created so there really is no reason to filter out noise. However, even without a squelch setting to manage on a digital system, understanding and managing noise in your system is critical. Be sure to monitor spectrum conditions over time, step up your antenna game, and filter out interference and noise anywhere you can.